LEDGlow’s Million Color Wheel Well Lighting Kit, a simple addition for some added customization! Add a unique multi-color lighting effect to your vehicle’s wheel wells with 48 ultra-bright SMD LEDs housed in (4) 24” flexible tubes, an easy to use control box and a 4 button wireless remote. 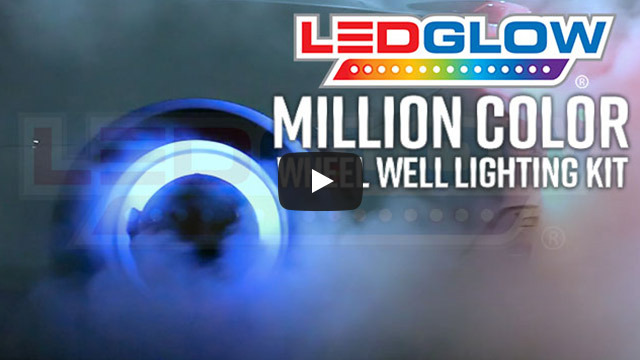 If you’re looking to add a unique modification that is guaranteed to grab attention, LEDGlow’s Million Color Wheel Well Lighting Kit is the right fit for you! The Million Color Wheel Well Lights illuminate your vehicle’s wheel wells to create an individual look that allows your vehicle to stand out with multiple solid color options and a variety of different lighting effects. These Wheel Well LED Lights utilize 48 ultra-bright SMD LEDs that are housed in (4) 24” thin, flexible tubes allowing each tube to easily contour to your preferred mounting location above the tire to the fender well or behind the strut. 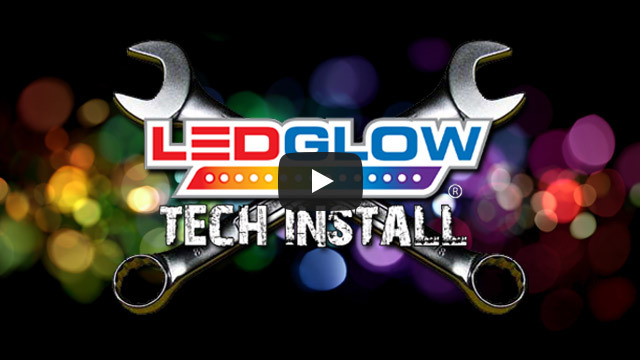 Each Wheel Well Kit includes a control box that features 18 solid color modes, 5 scanning modes, 5 flashing modes, 5 chasing modes, as well as a color cycle mode and a million color fade mode that allows for unlimited customization. With 5 built-in sound activation modes, your wheels can glow in unison with music as the LEDs react to the sound. All of the incredible lighting effects can easily be selected and cycled through using the control box or the included 4 button wireless remote. Each of the flexible tubes are manufactured from extremely durable rubber and feature 13’ of power wire for maximum mounting capabilities. This Million Color Wheel Well kit can only be powered by a 12 volt system and includes self-tapping screws and zip ties to ensure installation is a breeze. Each LEDGlow Million Color Wheel Well Lighting Kit comes standard with a one year limited warranty, as well as free lifetime technical support. Bought these and the interior lights for my hubby birthday.he's 51. He loves them! We had so much fun playing around with all of the different colors and patterns. Some young boy's at a gas station were showing off their lights so he turned on his, the young one's were very impressed and wanted to know where we got them. We'll be back for the under body next. Great quality product and prices. Purchased these lights about a year ago and still to this day these lights work perfectly . Recently, like a week ago, I noticed in one of the settings the lights flash to the beat of music playing from a car I was parked next to at a car show. AWESOME, AWESOME, AWESOME. I had no idea they did this ability or setting. this is a great kit as far as easy of installation and function. Just one FYI if you are getting these for a full sized pick-up truck the cords from the back wheels probably wont reach the junction box under the hood. I had to drill a hole in the body under the back seat and run the cords though there to reach the box. then i powered the controll box of my amps power cords. Like i said works great just not perfect. I just got these led kit, and put them in the same day i got them. Man i got to say that these led wheel light are the snit.